'Fats' Bannerman is enjoying success as the writer and presenter of Thus Engaged, a romantic radio serial about the lives and loves of a Regency heroine. But when grim reality violently intrudes into Fats' life, his frail fantasies become unbalanced and his ability to separate fact from fiction breaks down, with devastating consequences. Featuring	a	compelling	central performance	from	the	great	British	screen	actor Ian McNeice (A Life Less Ordinary; Oliver Twist; Doctor Who), this controversial early film from the award-winning Hollywood filmmaker Christopher Monger (The Englishman Who Went Up a Hill But Came Down a Mountain and writer of the multi-award winning HBO production Temple Grandin, starring Claire Danes) caused a sensation upon its original release, when its subject matter was attacked by feminist groups. 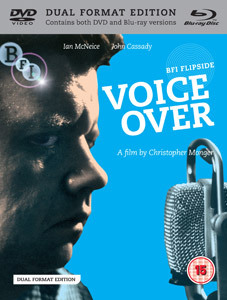 Unseen for decades, Christopher Monger's controversial feature Voice Over will be released by BFI Flipside in a Dual Format Edition (DVD & Blu-ray discs together) on 24th October 2011 at the RRP of £19.99. 34-page illustrated booklet with newly commissioned essays, biographies, original promotional materials, and recollections by Christopher Monger and Ian McNeice.